It looks like the smartphone party has come to an end. The slow down which began in the 2013/2014 timeframe has shifted to decline phase with fewer smartphones sold in 2017 as compared to the 2016 numbers. "Every smartphone manufacturer is now facing a world where, at best, they can hope for single-digit growth in smartphone sales — and many seem to be preparing for a world where they face declines," Jake Swearingen reports in New York Media's Intelligencer. — "In 2017, per the International Data Corporation, global shipments of smartphones declined year-over-year for the first time in history. In 2018, IDC says the same thing happened in the U.S. market. "We are at market saturation rates of 90 to 100 percent in many developed markets," says Ryan Reith, program vice-president at IDC." — "For manufacturers, the next decade will likely be a great shakeout, with some old guard names leaving the market, some newer brands becoming ascendant, and the winners acquiring and stripping the losers for parts." 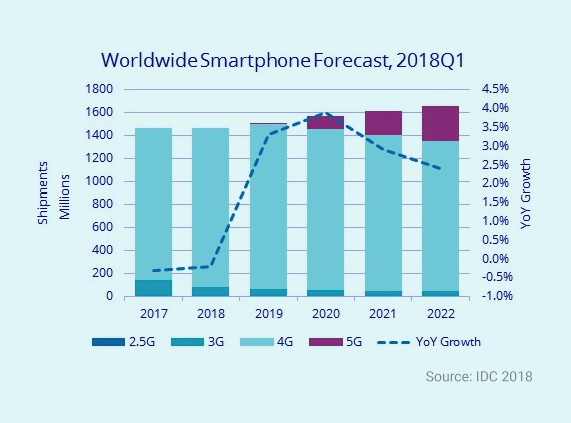 On the other had, IDC predicts the introduction of 5G smartphones in the second half of 2019 can ramp up growth across many regions in 2020. Earlier this year IDC projected 5G smartphone volumes to account for roughly 7% of all smartphones in 2020 or 212 million in total. "The share of 5G devices should grow to 18% of total volumes by 2022." Local Time: Wednesday, April 24, 2019 08:58 PM PDT – Page Load: 0.6511 Sec.